Stella Arnaldo's Blogspot: Enough already! "With reference to a letter to President Arroyo on June 24, 2008, during the [her] last working visit to the United States, President-elect Obama outlined issues and concerns for collaboration between the Philippines and the United States hinged on a "partnership that makes progress on 21st century challenges," Executive Secretary Eduardo Ermita said. He said the these issues include climate change, food security, poverty reduction, the future of the Association of Southeast Asian Nations, human rights in Burma and defense reform. 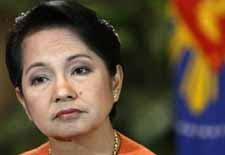 "President-elect Obama expressed confidence in successfully addressing these challenges," Ermita said. If the guy doesn't wanna talk to you, no amount of preening for the media and propaganda will make your phone ring, anu? Tigilan na ang kahibangan na 'yan! what a joke this pandak think obama will call her back from a low class third world country. no honor no class.